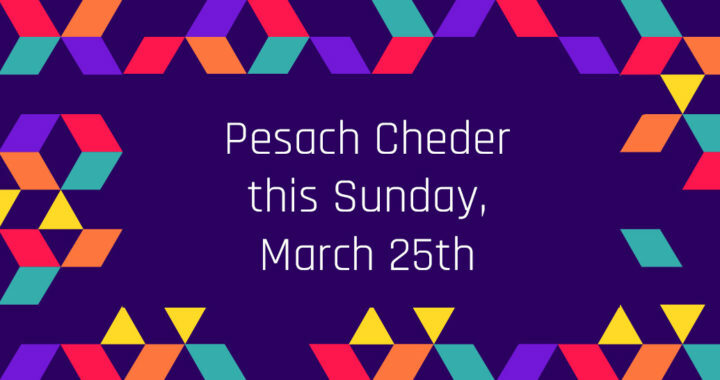 It’s time for a Pesach Cheder! Welcome and songs (Modeh Ani, Shema, numbers to 10, Aleph bet). Breif intro to Pesach and splitting the kids into groups. They’ll get to see the difference between the two and learn about Matzah and why we eat it at Pesach. The younger groups will take part in Pesach themed arts and craft activities. The younger group(s) will take part in a baking activity. The older groups will split into their 2 groups, the older to learn about Pesach through group discussion and activities- thinking about the exodus, what that means for us, being a stranger in foreign lands, etc. The younger group will be learning through games and crafts. We’ll come together to say blessings over fruit/veg/ kosher snacks and eat them! Please bring your kids in clothes that you dont mind being stained/ or bring an apron/old shirt for them to wear to protect their clothes. Please bring snacks with a Hechsher (kosher symbol) or fresh/ dried fruit or veg. It’s always lovely when people bring a little extra so there’s some to share with friends. Cheder costs 50p for members or £2 for non-members per child. Watch the Prince of Egypt (PG) whilst eating falafel, pita, cake and popcorn! There’ll be a space set up for younger children to play and eat too, as the film is long and a little scary. We hope to see lots of your lovely faces there! Please feel free to invite friends and family too- just let Shelley know by email so that we can cater for you.